There are several additional opportunities for this Mixer including a historic house tour, group dinner and evening trolley tour. Please indicate the activities you plan to attend on the registration form. Come meet your colleagues in The County! Kimberly Smith, Presque Isle Historical Society, and Erin Bishop, Maine Archives & Museums, are taking MAM’s Mixers north this fall! Join us for a social hour compliments of Hampton Inn, Presque Isle. Enjoy socializing and networking with your colleagues in museums, archives and the cultural tourism sector. After a short presentation, climb aboard Molly the Trolley for a fun ride to the 1875 Vera Estey House Museum for a free tour. There’s lots to do an see here so plan on staying the night! A group of rooms has been reserved at the Hampton Inn until November 2 at the reduced rate of $99 plus tax. Call 207-760-9292 or e-mail Jan at jan.lucas@hilton.com to reserve. 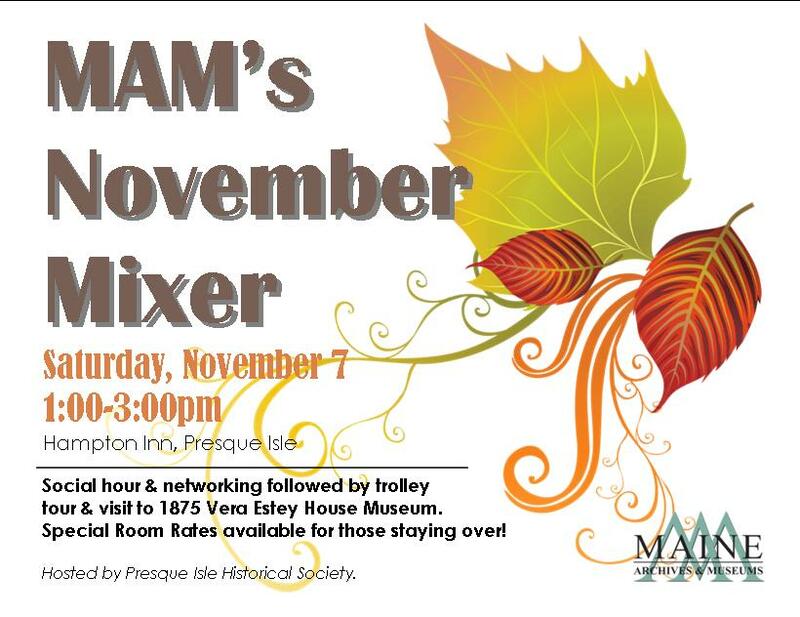 Mention Maine Archives & Museums/Presque Isle Historical Society Mixer. For those interested in continuing the fun, a group dinner can be arranged along with a free evening city-wide tour. This event is part of MAM's 2015 Program Series presented with support from the Maine Humanities Council.